Think your wife is super wonderful, super supportive or are you looking to get out of the doghouse? 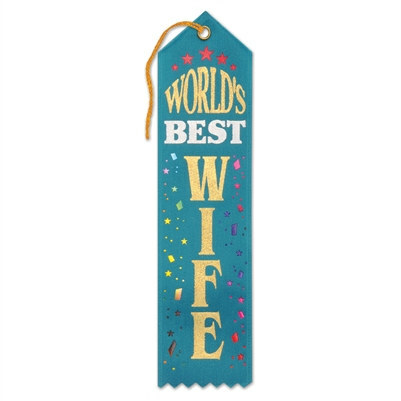 Regardless of the reason, shower your wife with the biggest complement of them all by presenting her with World’s Best Wife Ribbon. This eight (8) inch long by two (2) inch wide ribbon is a heartwarming way to appreciate the love of your life. Done in a beautiful teal color, World’s Best Wife Ribbon is made out of satin-finish nylon. To emphasize how great your wife is, this ribbon has “World’s Best Wife” printed in gold and silver with multi-color confetti in the background. For added detail each World’s Best Wife Ribbon has a bottom edge is serrated and top is folded to a point with a reinforced metal grommet and six (6) inch gold string loop. Bring a tear to your wife’s eye simply by presenting her with World’s Best Wife Ribbon as a token of your appreciation.